Welcome to Best Western Crystal River Resort! Crystal River Florida hotels are close to a variety of attractions, and our Crystal River hotel staff is committed to making your stay special. Guests at Best Western Crystal River Resort are treated to the best in service and quality. Hotels in Crystal River are close to the many fishing and water activities, such as surfing lessons and jet skiing. Whether you're here for a relaxing vacation or looking for an adventure, you can count on our Crystal River hotel to put you close to all of the region's top attractions. Our Crystal River hotel offers great amenities and a great location right on Springs Fed Bay. We're just off the main highway and close to restaurants and water activities. We're also close to a lot of golf courses, which is a must for vacationers looking to squeeze in some time on the greens. Nature trails, bird watching and biking trails are all located nearby and are favorite activities for all travelers. If you want to try snorkeling with the manatees, it's just a short distance from our Crystal River hotel. Fishing and scalloping are also an option, and it's a great way to spend a family vacation. The State Wildlife Park offers plenty of opportunities to get up close and personal with nature. Pack your good camera and get ready for the trip of a lifetime. There's plenty of gold in the area, but rejuvenation and relaxation also reign supreme. Kick back and work on your tan, or spend the afternoon perusing the local boutiques and dining establishments. It's your slice of paradise, and our Crystal River hotel staff is happy to provide you with everything you need for a wonderful stay. We'll also provide tips and recommendations on must-see spots in the area. 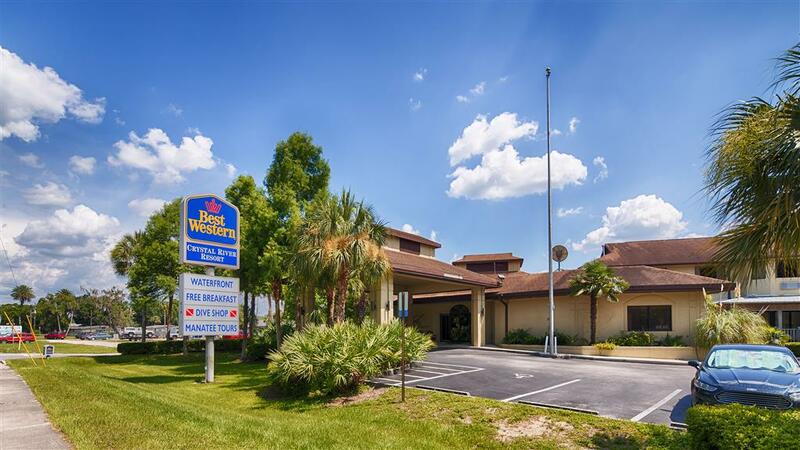 Book your next stay at Best Western Crystal River Resort and enjoy a trip to paradise! Enjoy your stay. Pool - Outdoor pool 8:00 a.m. to 10:00 p.m.
From: From:All Directions . Take US Highway 19 and 98 North. The Best Western Crystal River Resort is located 1 mile north of Highway 44.